With the exception of the well-publicized Operation Moses, Joshua, and Solomon Airlift of 20,000 Ethiopian Jews from that war and famine ravaged nation to Israel between 1984 and 1991, few people outside the Middle East are aware of the tens of thousands of people of African ancestry living in the Jewish state. As University of Tel Aviv historian Dafnah Strauss writes below, these Israelis of African ancestry are four distinct communities with different places of origin, different cultures, and different religions. Nonetheless, they now call Israel home and continue to try to integrate themselves into a population which is deeply ambivalent about their presence. Four major groups make up the sub-Saharan African Diaspora in Israel: 1) Ethiopian immigrants, the majority of which belong to the Ethiopian Jewish community, the Beta Israel, but including a significant minority of descendants of Christian Ethiopians of Jewish ancestry called the Falas Mura; 2) African migrant workers and refugees; 3) Black Bedouin; and 4) African-American ‘Black Hebrews,’ who call themselves the African Hebrew Israelites. Each group comprises a distinct ethnic, religious, and social community and they have little interaction with each other. These groups, comprising a black minority within a mostly white but multi-ethnic country, underscore the complex and multifaceted nature of Israeli society and reflect the intense public discourse concerning the boundaries of Judaism and Israeli citizenship. The first- and second-generation Ethiopian immigrants make up the largest community of sub-Saharan descent in Israel, numbering 125,000. Eighty-thousand Ethiopian immigrants arrived in Israel in several waves since the 1980s, including two massive airlifts: between November 1984 and January 1985, 6,700 immigrants were brought from refugee camps in Sudan, where they congregated after smuggling themselves across the Ethiopian-Sudanese border by foot; and in May 1990, nearly 14,000 immigrants were brought from Addis Ababa within 36 hours. Those arriving in Israel prior to 1991 were predominantly members of the Jewish Beta Israel community also known pejoratively in Ethiopia as Falasha. Since, 1991, however, most of the 35,000 Ethiopian immigrants who have arrived are Falas Mura, Ethiopians of Jewish ancestry who converted to Christianity during the 19th and early 20th centuries. Initially the Beta Israel were enthusiastically welcomed into Israel, a nation of five million inhabitants in 1990. That enthusiasm gradually gave way to tensions over both religion and culture. Separated from mainstream Judaism for centuries, the Beta Israel community preserved a version of Jewish observance based solely on the Bible which evolved vastly different from Orthodox or mainstream Judaism that flourished in Europe, Asia and North Africa. Although the Israeli Rabbinate, Israel’s Orthodox state-religion establishment, officially recognized the Beta Israel as Jewish in 1975, it raised doubts regarding the religious status of the individual immigrants and demanded that the majority of them undergo symbolic conversion in Israel. Most Beta Israel resented this demand which they deemed humiliating and racist. That resentment generated a month-long sit-in protest in 1985 which was supported by a large number of Israeli citizens, forcing the Rabbinate to withdraw its demand. Most Orthodox rabbis, however, continue to this day to refuse to perform and register marriages of Ethiopian Israelis. The tension between the Ethiopian community and state authorities was intensified in 1990s by the religious establishment’s refusal to recognize the authority of the Beta Israel’s respected religious leaders, the Qessotch (Kessim) in performing life-cycle ceremonies. These tensions were exacerbated by a growing frustration among younger immigrants and their Israeli-born children who encountered discrimination and racist insults. In January 1996, for example, an exposé in the Haaretz newspaper on the national blood-bank policy revealed that for over a decade all blood donations by Ethiopians were routinely discarded, due to the high rate of AIDS carriers among this group of immigrants. This policy symbolized for many Ethiopian immigrants their rejection by Israeli society and prompted a violent demonstration by ten thousand young women and men in Jerusalem. Although this largest demonstration in the brief history of the Ethiopian immigrant community did not change Israeli policy, it was a watershed for the community, bringing forth a young, outspoken leadership and serving as impetus for the rise of numerous community organizations. Despite the rise of organizations and an increasingly visible presence in Israeli public life symbolized by the election of Addisu Messele to the Israeli Knesset in 1996, most immigrant families sought a quiet compromise between their community heritage, their encounter with Orthodox Judaism, and the modern, secularized majority-culture surrounding them. If the older generation continued to focus on its religious identity, most youngsters identified themselves as both Israeli and as members of a global black diaspora. They manifest this in clothing style often imitating American urban black youth, and a preference for Rap and Reggae music. While cultural and religious issues have been most salient in the public eye, economic concerns have remained the most crucial for Ethiopian households in Israel since the 1980s. Ethiopian immigrants and their families continue to constitute one of the poorest populations in Israel, with high rates of unemployment and dependency on welfare support. Coming from rural communities, where they lived as subsistence farmers and artisans, Ethiopian immigrants arrived in Israel with no educational and financial resources suitable for a modern, Western economy. Their slow integration into the Israeli labor force has been aggravated by their residential concentration, despite governmental efforts to prevent such a pattern, in peripheral towns and poor neighborhoods. Second generation Israeli Ethiopians have achieved much higher levels of education than their parents. They enter college in large numbers and participate in the labor market at similar rates as the general population. Many have established their own businesses, catering to the Israeli-Ethiopian community and trading goods with Ethiopia. Nevertheless, their overall educational achievements and level of participation in higher education still lag behind those of their peers in the general population, despite a nation-wide university-level affirmative action policy. Ethiopians with university degrees still find it harder than their peers to find employment appropriate to their field and level of education. In spite of the myriad difficulties, including manifestations of racism, most community members exhibit a high level of identity with the Jewish people and with Israel. One indication of their deep commitment to integration into Jewish-Israeli society is the high participation of young men in the military service, one of the most important symbols of membership in Israeli society. Another indication is the unprecedented degree of community protest voiced as a demand to be treated as equal Jews in the Jewish state. African migrant workers and refugees make up the second largest group of people of sub-Saharan origin in Israel. The national composition of this group has shifted over the years, due to fluctuating waves of African migration and changing government immigration policies in Israel. Since 1990, Africans have entered Israel via two major routes. During the 1990s and the early years of the 21st century most migrants, largely from Nigeria and Ghana, entered on tourist visas and stayed to become undocumented laborers. Since 2005, a growing number of refugees and migrant workers, mostly from Darfur and South Sudan, Eritrea, and Ethiopia, have smuggled themselves into Israel through the border with Egypt, often after crossing the Sinai Desert by foot and at times suffering abuse from local Bedouin. The first wave was clearly part of the global Third-World labor migration into advanced Western countries which accelerated in Israel when Palestinian workers were barred entrance to the country in the late 1980s. The second wave is closely associated with displaced populations due to civil war and genocide in Africa. The first wave of African migrant was comprised of men and women with a relatively high educational level who were able to improve their income but not their social status by working as menial labors in Israel. 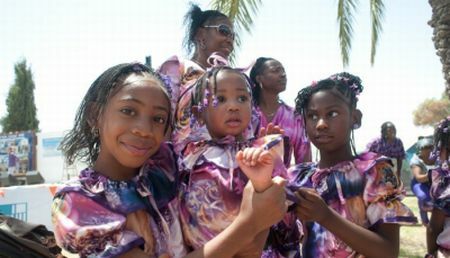 By the late 1990s, this African community concentrated in the impoverished neighborhoods of southern Tel Aviv. They had evolved into a partly clandestine but bustling community, numbering around 12,000. The community established over 30 churches, had a network of cheap child care facilities, and was able, with the intervention of influential Israelis, to establish the first legal NGO of undocumented migrants in Israel, The African Workers’ Union. The churches, mostly Evangelical and Pentecostal, provided fellowship, guidance, and assistance, while enhancing the migrants’ identity as Christian Africans on a special sojourn in the Holy Land. In the spring of 2002, the Israeli government’s de-facto tolerance toward undocumented migrants was replaced by a strict policy of deportation. By the beginning of 2004, the African community had dwindled to approximately 3,000 who were mostly women and children. As the community disintegrated, most of the churches shut down, and the African Workers’ Union collapsed. The second wave of African migrants, mostly political refugees and asylum seekers, began arriving in small numbers just as the first wave of Africans was leaving. This stream increased significantly in 2006, after the Egyptian policy toward refugees became intolerant, prompting many of them to cross the border into Israel. As of the summer of 2011, African refugees and asylum seekers in Israel numbered approximately 35,000, with new people crossing in from Egypt almost daily. They congregate in southern Tel Aviv, the Red-Sea resort town of Eilat, and Jerusalem, where Ethiopians seek the assistance of the Ethiopian Church, which enjoys an official status and owns property in the city. Although the Israeli government has opposed this influx of refugees, claiming that the vast majority are in fact migrant workers, it has been inconsistent in its treatment of these men, women and children. At first, the mostly Darfurian refugees were removed from the border to large cities, where they were assisted by NGOs and private citizens. However, with the increase in the number of asylum seekers entering Israel, government policies tightened and in a few cases refugees were turned back into Egypt. Most new arrivals, however, are detained for a couple of months but in some cases up to several years, after which they are released to fend for themselves and file asylum requests with the UN High Commission for Refugees. With the dramatic increase in the number of the newest wave of African refugees, its members are exposed to growing hostility from local residents who are angered over falling property values and rising crime rates in their neighborhoods. This much larger second-wave African community in Tel Aviv, however, has reestablished churches and community businesses and created a new officially-recognized NGO, the African Refugee Development Center (ARDC). Working with several Israeli organizations and the Tel Aviv municipal government, the ARDC has provided temporary shelter for the newly arrived, care for unaccompanied minors, and basic child health care, as well as advocacy and legal assistance. Black Bedouin are the descendents of African slaves purchased by Bedouins, the semi-nomadic Arab population in the Negev desert region of southern Israel. The Israeli black Bedouin number 10,000 out of approximately 180,000 Bedouin in the country. Although slavery has been illegal in Israel since the nation’s founding in 1948, the black Bedouin are still referred to as abed, a pejorative word that means both slave and black, and considered to have the lowest social status within Bedouin society. Many black Bedouin are affiliated with the Abu Balal tribe, a name that is reminiscent of Bilal, the Ethiopian companion of the Prophet Mohammed. All black Bedouin are Muslim like the rest of Bedouin society. Although the countries of origin of the black Bedouin are unknown, their ancestors are most likely from east Africa. Most of the ancestors were probably bought as children either in Egypt or Arabia during the nineteenth and early twentieth centuries and taken to the Negev. The slaves performed household work, tended animals, worked in the fields, and at times served as armed soldiers. Within the highly hierarchical and paternalistic Bedouin society, they were situated at the bottom of the tribal system. Their status was lower in fact than that of white slaves, who stood below the peasants (Falahim), who themselves tended the fields of the land-owning Samran, or ‘true’ Bedouin. This social stratification was most clearly manifest in the prohibition on intermarriage with black Bedouin, even as free people. Thus, adult slaves could only marry other black Bedouin slaves. Even today, there is opposition to a black Bedouin marrying a ‘peasant’ woman because it represents intermarriage between whites and blacks. Under the British Mandate over Palestine (1917–1948), slavery was legally abolished, but authorities did little to enforce the law. Slavery finally collapsed in the early 1950s under the political and social upheaval brought about by the war of 1948 and the establishment of the State of Israel. During a census taken in 1952, many black Bedouin asserted their new freedom by registering as members of the Abu Balal tribe, led by Suleiman Abu Balal, the charismatic grandson of a slave who was appointed Sheikh by Israel. When the Israeli government began settling the Bedouins in towns during the 1970s, most black Bedouin and landless peasants saw their opportunity to become property owners and responded positively to government efforts. Today approximately 60% of the black Bedouin (about 6,000 people) live in three neighborhoods in the town of Rahat in the northern Negev. As part of the general Bedouin population, which constitutes the poorest and most marginalized social group in Israel, black Bedouins continue to suffer from high unemployment rates and poverty. The African Hebrew Israelite Community is the only group of African American Jews who immigrated as a community to Israel. Mostly from Chicago, Illinois and Detroit, Michigan, the group first organized in 1963. They believe that American blacks are the true Jews, descended from the Patriarchs and the lost Ten Tribes, who were exiled to Africa. With a ‘Back to Africa’ vision and under the spiritual leadership of a charismatic young man, Ben Carter, who had taken the Hebrew name Ben Ammi Ben Israel (son of my people, son of Israel), many moved in 1967 to Liberia. Beginning in 1969, members of the group, both from Liberia and the United States, gradually moved to Israel, which they consider part of Africa and their true homeland. Settling in the small, desert towns of Dimona, Mitzpé Ramon, and Arad, the community numbers today about 2,500 persons and is the smallest of the groups of African ancestry in Israel. While their self-proclaimed Jewish identity was not recognized by Israel, they rejected offers to convert to Judaism. Yet the group insisted on remaining in Israel despite its members’ undocumented status. This situation became more acute in 1978 after a number of community members chose to waive their American citizenship to avoid deportation. Prolonged negotiations involving the Israeli government, the community’s leadership, American-Jewish organizations, and the American State Department resulted in a 1990 compromise which restored American citizenship to the group while allowing them to remain in Israel as temporary residents. As such, they received work permits to earn a living. In 1997 a community school, built with funds from the U.S. government, was incorporated into the state school system. As of 2004, community members have been recognized as permanent residents, thus enjoying full access to all government social benefits. In 2006 the community was granted land on the outskirts of Dimona, on which they established their communal agricultural community which they named Shomrei Ha-Shalom (guardians of the peace). Since 2009, community members have begun to receive Israeli citizenship and high school graduates have begun to enlist into the Israeli Defense Force. The community, which holds a partially collective economy, derives its income from organic soy products sold across the country, a line of hand-made eco-clothing that has become popular among African-American celebrities, and a renowned choir and musical band which performs primarily abroad. As promoters of organic-vegan life style, the community has attracted much attention from around the world, especially government officials from Africa. Ethiopian Jews: Steven Kaplan and Hagar Salomon, “Ethiopian Jews in Israel: A Part of the People or Apart from the People?” in Jews in Israel: Contemporary Social and Cultural Patterns, ed. Uzi Rebhun and Chaim I. Waxman (Boston: Brandeis University Press, 2004), 118-148; Uri Ben-Eliezer, “Becoming a Black Jew: Cultural Racism and Anti-Racism in Contemporary Israel,” Social Identities 10 (2004): 245-266; Jack Habib et al., Follow-Up on Key Indicators of the Nationwide Situation of the Ethiopian-Israeli Population (Jerusalem: Brookdale, 2010). Migrant Workers and Refugees: Galia Sabar, “African Christianity in the Jewish State: Adaptation, Accommodation and Legitimization of Migrant Workers’ Churches, 1990-2003,” Journal of Religion in Africa 34.4 (2004): 407-437; Nelly Elias and Adriana Kemp, “The New Second Generation: Non-Jewish Olim, Black Jews and Children of Migrant Workers in Israel,” Israel Studies 15 (2010): 73-94; Joel Greenberg, “Flow of African Migrants Poses Dilemma for Israel,” Washington Post (http://www.washingtonpost.com/world/flow-of-african-migrants-poses-dilemma-for-israel/2011/04/14/AFsxuyjD_story.html). Black Bedouins: Susan Beckerleg, “African Bedouin in Palestine,” African and Asian Studies 6 (2007): 289-303. African Hebrew Israelites: A. Paul Hare ed., The Hebrew Israelite Community (Lanham, Md: University Press of America, 1998); Fran Markowitz, Sara Helman and Dafna Shir-Vertesh, “Soul Citizenship: The Black Hebrews and the State of Israel,” American Anthropologist 105(2) (2003): 302-312); Dimona Rising: The official Online Site for Members of the Dimona Alumni (http://www.dimonarising.org/Dimona_Rising/Dimona_Rising-English/Dimona_Rising-English.html). Ethiopian-Israeli Population (Jerusalem: Brookdale, 2010). Black Bedouins: Susan Beckerleg, “African Bedouin in Palestine,” African and Asian Studies 6 (2007): 289-303.